Have kids write their own silly story just like it! 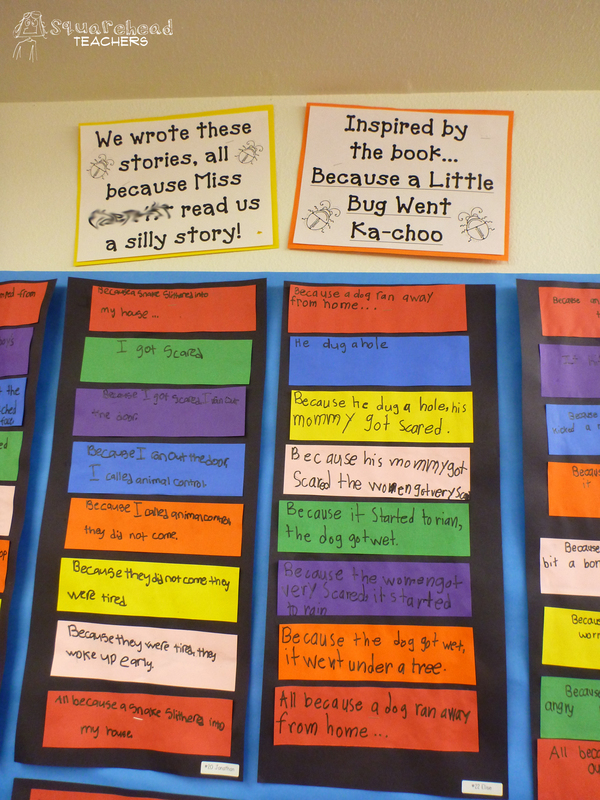 This third grade teacher had her students write each event in the story on a different color and glue it to black paper. The projects look great and the kids absolutely LOVED reading their silly story to their peers! For younger kids, I’d recommend creating a shared writing (whole class story) in the style of this book. You might also consider having kids illustrate their story in boxes on a page (like comics). Fun, fun, fun… all because a little bug went ka-choo! This entry was posted in Art/Crafts, Books, Reading, Writing and tagged Children, Education, Elementary School, Homeschool, Kids, Reading, stories, Teacher Resources, Teachers, Teaching, Writing by Squarehead Teachers. Bookmark the permalink. This looks like a fun book, and a fun subsequent activity to try! Let us know what you think about the book or the writing activity. Thanks for stopping by!